Base In : 10,6 x 10,6 in. to 11,8 x 11,8 in. 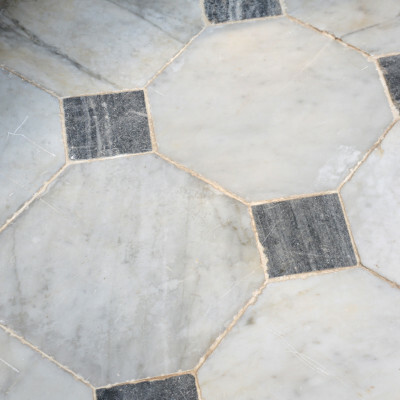 AMBOISE - octagonal shape veined gray marble paving and marble cabochons dating from the 19th century. Very popular in the 18th century and used in galleries, hallways, anterooms palaces and large hotels, the model of this pavement already existed in Antiquity in the mosaics at Pompeii and Saint-Romain-en-GalIt was also used in the Middle Ages as ceramic floors decor, especially in the Cathedral of Coutances. But it is in the classical period that paving become famous. He will remain associated with the luxury of the Grand Trianon or Versailles, and the sacred chapels or churches. Other dimensions available.